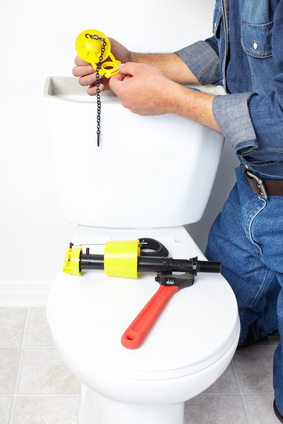 As part of our full-service residential and commercial plumbing, we would like to make sure you know that we offer toilet repair and replacement at affordable rates that our competition just can’t touch. If you’ve been quoted a price, tell us their quote and we’ll do everything we can to beat it. It’s just that simple. Our fully-licensed, insured and background-checked toilet repair experts will find an affordable solution that suits you perfectly. Knowing whether you simply need a toilet repair or a replacement can sometimes be difficult to determine. If your toilet regularly clogs up and requires plunging on a regular basis, it's very likely there's significant blockage, either in the trap or further down the drainpipe. Unfortunately, it can also be symptomatic of a more serious problem a little further downstream in the sewer pipes. Express Sewer & Drain is your best choice for toilet repair 24/7/365. We offer toilet replacement and installation to all Sacramento residences and businesses. Leaking Tanks. Running Toilet Bowls. STOP! If you hear water running in your toilet tank for extended periods of time after a flush, your tank is leaking; it's costly, wasteful, and irritating to boot. Did you know that your water is flooding out of the overflow tube, possibly wasting up to 200 gallons of water daily? Your problem might be a worn or rusted out overflow pipe or just an old flush valve assembly. Occasionally, the problem is a worn out flapper valve. Call us to fix your toilet. You will probably save enough money on your next few water bills to cover the low cost of our services. Want to upgrade to a greener, low-flow toilet? Need advice on which one is the best? Call us! If your toilet was manufactured before 1994, it is probably costing you a fortune in water. You’re just flushing away your hard-earned money. Updated, eco-friendly, low-flow toilets consume only 1.6 gallons per flush without sacrificing flushing power. Our fully-licensed and insured toilet replacement specialists are well-acquainted with all industry advancements. By staying on top of forward-thinking plumbing, we can pass that value on to you. Plumber’s Tip: Always pay close attention to your water bills. Sudden spikes might indicate leaks in your home or other property. Leaking toilets are not uncommon. Call us. We have fast, cheap solutions that last! Some of the newest toilets are engineered for conservation. Some designs have a dual flushing system which uses only 0.9 gallons to flush liquid waste but all 1.6 gallons to flush solid waste. Buy sensibly and you can save a lot of money down the road. Call us if you have any questions about the newest plumbing technologies, if you need toilet repair advice, or if you need to install a new unit. At Express Sewer & Drain, we give you options with up-front, flat-rate pricing and NO hidden surcharges!